Good news! 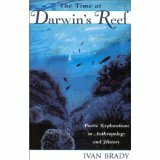 I’m happy to report that one of my favorite books, The Time at Darwin’s Reef: Poetic Explorations in Anthropology and History, has just been reproduced by Altamira/Rowman & Littlefield (2003) in e-form for Nook and Kindle. On the premise that there are many ways to see and to say things, and therefore to know them, and noted for blurring the boundaries between the sciences and humanities, the Reef’s crossover appeal has supported its use as a textbook in advanced anthropology and writing arts courses and its overall popularity in individual sales to the public. Clustered around my experiences in the Pacific and Mexico, it represents my take on the nature of time and place and various forms we can use to represent them—poetry, essays, paintings, and more. In addition to poetry turned into history with datelines real and imagined, and much to say about the nature of fiction itself, the collection includes several short essays (notably a widely-reproduced one with associated poetry regarding the tragedies of 9/11), and an integration of the written word with watercolors painted by the late Janie Kelly Brady, my beautiful wife. Now an historical document in its own right, the original result got a bit of a jump on what has been identified and promoted expertly by many thoughtful writers in recent years as Arts-Based-Research (including outstanding works by Monica Prendergast and Patricia Leavy). Thanks again for your support! I did a reading at a private party in Prescott last night. One of the guests (Sheila) asked how my personal life was related to what I have assigned to Aaron McCaan’s personality and adventures in my novels. I fumbled through a few answers, not having thought about it much in advance. Here’s a little more detail I’ve cooked up this morning. An old saw for fiction authors is they write about what they know and then embellish the facts and actions in pursuit of a good story line. In no particular order of intensity, here are some personal groundings for writing about Aaron McCaan, the protagonist in my mystery series. All of it appears in one form or another in the books. Been awestruck on many occasions by the natural beauty and changing scenery in deserts. Held a loved one in my arms while she died. Held pets through their passings from life to death. Been scared by unidentified things stalking me in the dark. Had close encounters with dangerous predators (two mountain lions, one bear). Been bitten by spiders and stung by a scorpion. Had a stare down with a rattlesnake. Owned an original 1964 Ford Mustang, my first new car. Pushed being thirsty to the limits (4 four days) in a hot climate. Had a truly bad hangover. Had a concussion and broken bones. Used a map and compass to negotiate remote territory. Been lost hiking in what I thought was familiar territory. Been chased by bad guys. Camped out with minimal gear in the desert when it snowed. Worked as a reporter at newspapers. Have college degrees in anthropology and history. Carefully explored the lower Colorado River territory. See also Thomas King’s Our Unprotected Heritage (Walnut Creek, CA; Left Coast Press, 2009) for an extended discussion of Mojave tribe problems related to PG&E and related constructions in and around the Maze. I’m very happy to report that my Aaron McCaan mystery novels are available at Amazon.com and Barnes&Noble.com.